Holidays in a tent on your campsite in Orosei! Making the most of the countryside in a tent, falling asleep to the sound of the sea and immersing yourself in the wonders of the pine forest, being caressed by the melodies of nature and, come morning, feeling the dappled sunlight on your skin as it filters shyly through the trees… What could be better than a campsite in Orosei facing out over the crystal-clear sea, for a truly unforgettable tent holiday? 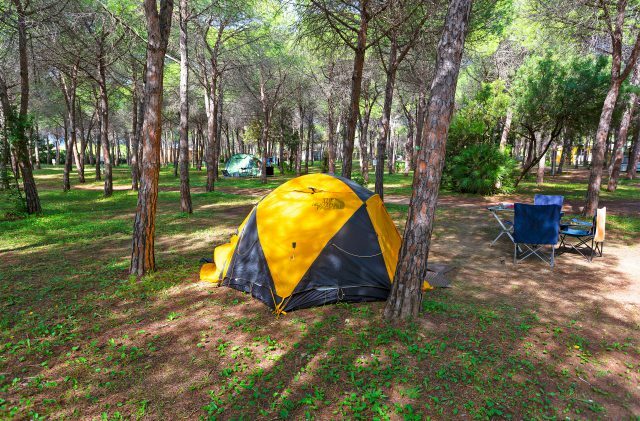 Spending your holidays on a campsite in a small tent is the most economical way to access the Camping Cala Ginepro experience. In this way, you can enjoy a vacation under canvas in Sardinia at a very reasonable price, with all the comforts of the facilities on offer at this seaside campsite, with three direct routes to the beaches and the reef. On our campsite in Orosei, included in the cost of every pitch is the supply of electricity to CEE standards (max 5A) via multiple power points, so it may be a good idea to use an extension cable. Also free of charge are hot showers and the entry of a car or motorbike, with parking in the dedicated communal areas.